Figure 1. 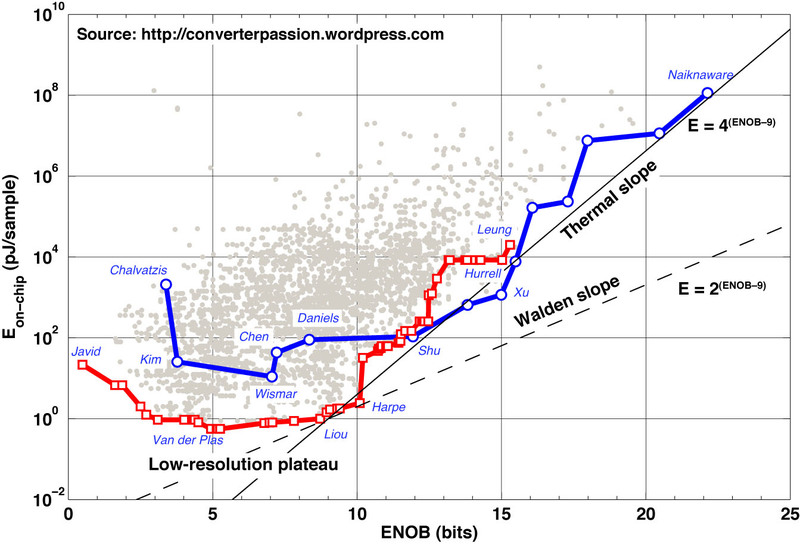 Evolution of best reported Walden FOM for delta-sigma modulators (o) and Nyquist ADCs (#). 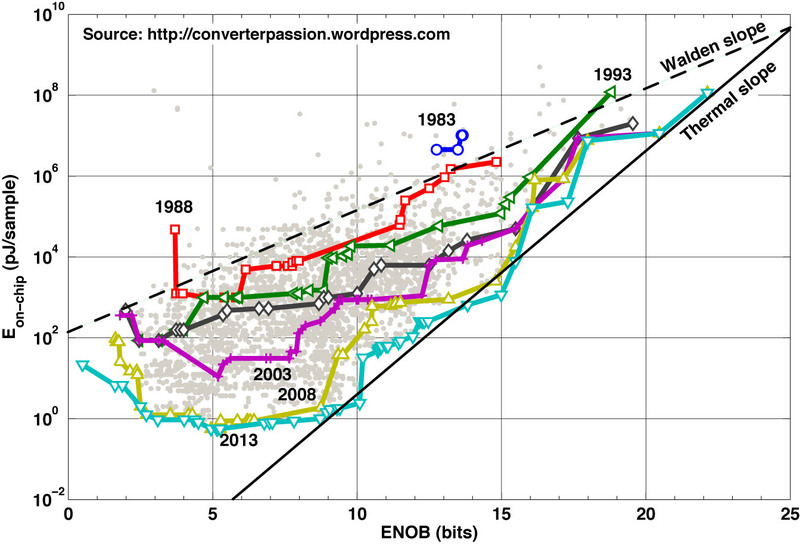 Monotonic state-of-the-art improvement trajectories have been highlighted. Trend fit to DSM (dotted), and Nyquist (dashed) state-of-the-art. Average trend for all designs (dash-dotted) included for comparison. FA1 is sometimes referred to as the Walden or ISSCC FOM and relates the ADC power dissipation to its performance, represented by sampling rate and conversion error amplitude. The best reported FA1 value each year has been plotted for delta-sigma modulators (DSM) and Nyquist ADCs in Fig. 1. Trajectories for state-of-the-art have been indicated, and trends have been fitted to these state-of-the-art data points. The average improvement trend for all ADCs (2×/2.6 years) is included for comparison. Still, if anyone is curious to know … 🙂 … the state-of-the-art data points fit to a 2×/14 months trend between 2000 and 2010. That’s actually faster than Moore’s Law, which is traditionally attributed a 2×/18 months rate -. A new twist on “More than Moore”, perhaps? Even the more conservative overall 2×/21 months trend is close enough to conclude that the state-of-the-art FOM for Nyquist ADCs has developed exponentially in a fashion closely resembling Moore’s Law. And that’s got to be an impressive trend for any analog/mixed circuit performance parameter. The acceleration in state-of-the-art is almost completely defined by successive-approximation (SAR) ADCs , -, accompanied by a single cyclic ADC . The superior energy efficiency of the SAR architecture was empirically shown in . A significant part of the acceleration can be explained by the increased tendency to leave out, for example I/O power dissipation when reporting experimental results – a trend also observed by Bult . 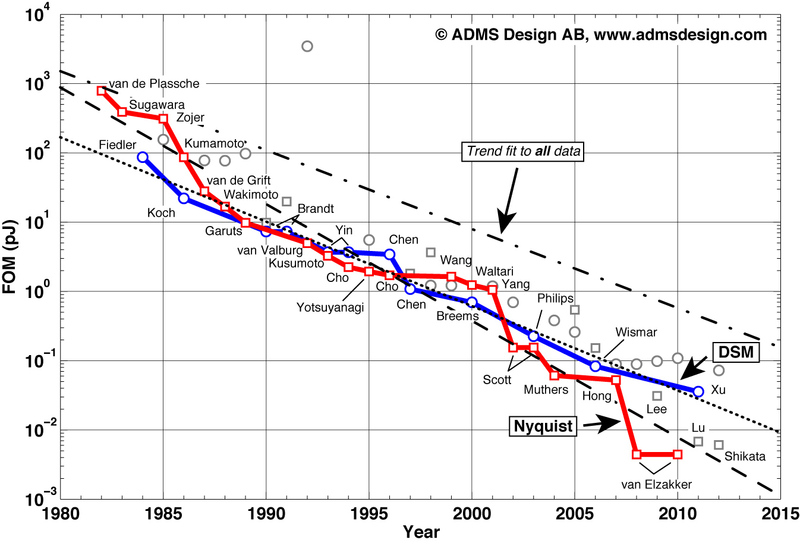 The FOM in the graph was intentionally calculated from the on-chip rather than total power dissipation because: (a) ADCs are increasingly used as a system-on-chip (SoC) building block, which makes the stand-alone I/O power for a prototype irrelevant, and (b) Many authors don’t even report the I/O power anymore. FA1 has a bias towards low-power, medium resolution designs rather than high-resolution, and thus benefits from CMOS technology scaling as shown in ,. 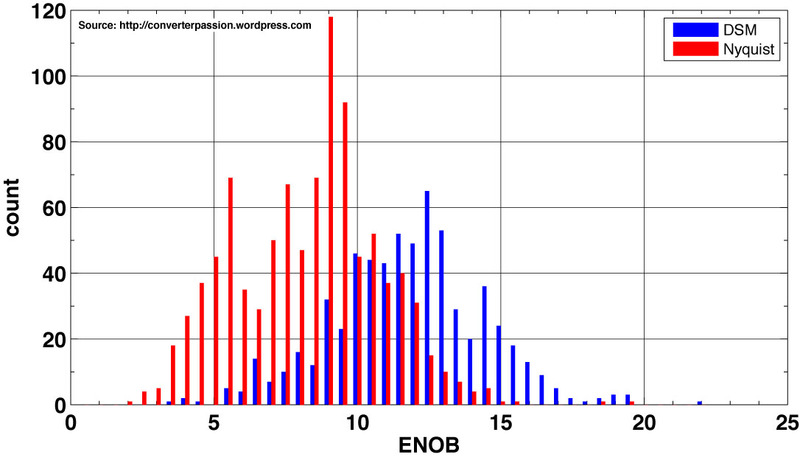 An analysis of the underlying data shows that, for the best FA1 every year, the trajectories for ENOB and P follows distinct paths towards consistently lower power and medium resolution. You simply gain more in FA1 by lowering power dissipation than by increasing resolution because (1) does not correctly describe the empirically observed power-resolution tradeoff for ADCs ,. This figure-of-merit will be the topic of the next post. S.-K. Lee, S.-J. Park, Y. Suh, H.-J. Park, and J.-Y. 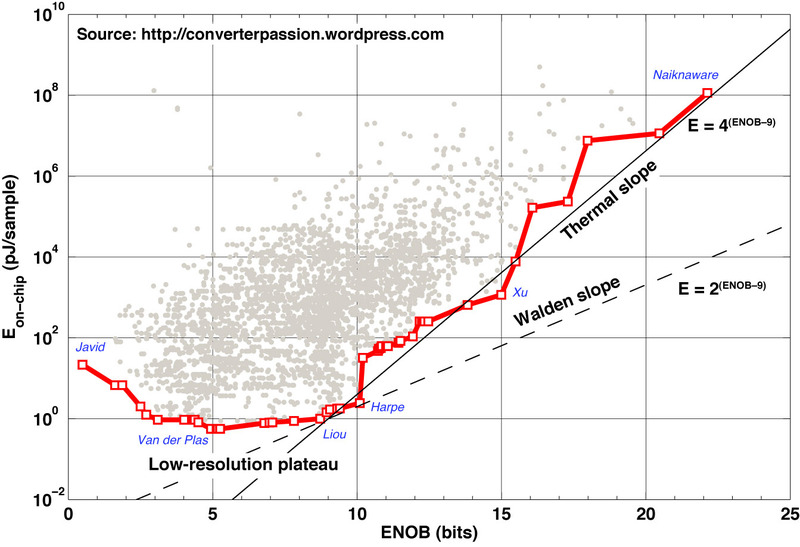 Sim, “A 1.3µW 0.6V 8.7-ENOB Successive Approximation ADC in a 0.18µm CMOS,” Symp. VLSI Circ. Digest of Technical Papers, Honolulu, USA, pp. 242–243, June, 2009. H.-C. Hong, and G.-M. Lee, “A 65-fJ/Conversion-Step 0.9-V 200-kS/s Rail-to-Rail 8-bit Successive Approximation ADC,” IEEE J. Solid-State Circuits, Vol. 42, pp. 2161–2168, Oct., 2007. M. D. Scott, B. E. Boser, and K. S. J. Pister, “An Ultra-Low Power ADC for Distributed Sensor Networks,” Proc. of Eur. Solid-State Circ. Conf. (ESSCIRC), Firenze, Italy, pp. 255–258, Sept., 2002. M. D. Scott, B. E. Boser, and K. S. J. Pister, “An Ultralow-Energy ADC for Smart Dust,” IEEE J. Solid-State Circuits, Vol. 38, pp. 1123–1129, July, 2003. D. Muthers, and R. Tiekert, “A 0.11mm2 low-power A/D-converter cell for 10b 10MS/s operation,” Proc. of Eur. Solid-State Circ. Conf. (ESSCIRC), Leuven, Belgium, pp. 251–254, Sept., 2004.